Just wanted to add my thoughts to the memory of Merle Harmon. As you know from working with him on the ASA he was as fine a gentleman as anyone would want to know in sports or elsewhere. My memories of working with him as far back as 1985 thru 1988 were that if he had an ego I never saw it. He was always helpful and treated anyone working with him as a friend and true CO-worker with no rank being pulled. In fact I will never forget the first time we worked together. I had been called to Arlington to fill in for his partner, Norm Hitzges, on a Texas Ranger telecast. In those days Merle did all nine innings of play by play. Norm never did any. 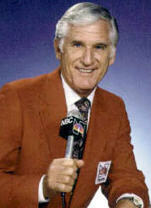 He was a fulltime color/analyst. I expected to do the same since I was just filling in for a couple of games. But when we went into the break before the 4th inning Merle turned to me and said, "Why don't you take over the lead for the next three innings?" I did not expect it and I had not asked for it. But Merle knew I was primarily a play by play guy and he made the offer on his own. That is just one example of the kind of guy Merle was and it is a wonderful memory I will never forget. We will ALL miss Merle Harmon.